Another view of the rainforest near Lake Quinault on the Olympic Peninsula. 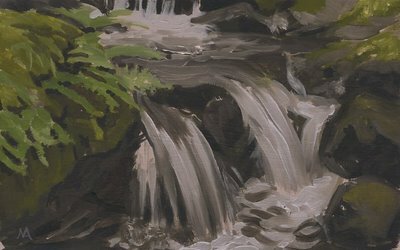 After climbing around on the rocks in this beautiful area for at least an hour I finally chose a spot and enjoyed painting these ferns and little cascade of water. 8 x 4.75 inches, oil on board. I have re-posted this image too, after adjusting the color and brightness to be faithful to the original painting. 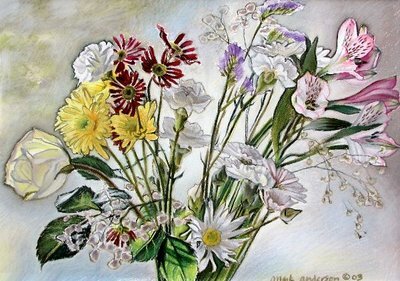 11 x 15 inches, chalk pastel on paper. 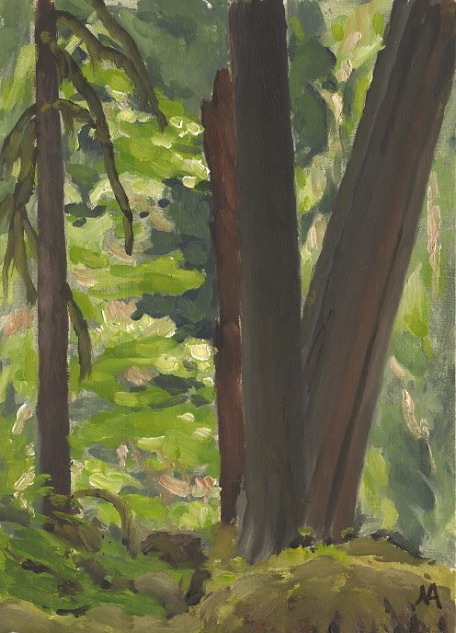 I'm having some photography problems with my Olympic Forest paintings. Here's a pastel from several years ago. 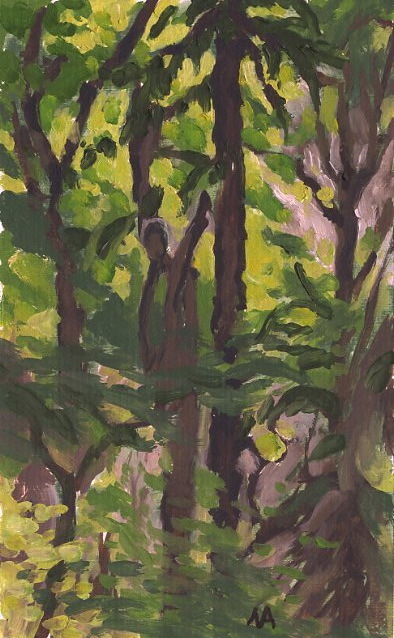 I re-posted the 'Screen of Trees' painting after improving the color. 8 x 5 inches, oil on board. 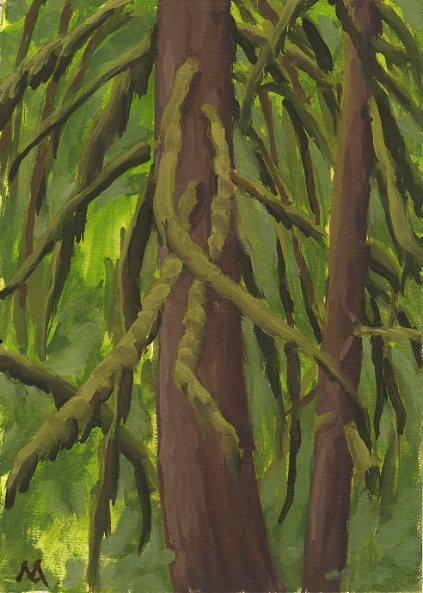 Here's the first painting I made away from the security of the campsite in the Olympic Peninsula. I felt that I could choose any spot and look in any direction and find 360 degrees of light, pattern and beauty. It almost didn't matter. In fact it would have been helpful if someone had just pointed arbitrarily and said "paint that". But since there was nobody to do that for me, I spent a good hour circling and wandering, like a dog preparing to lie down for a nap. 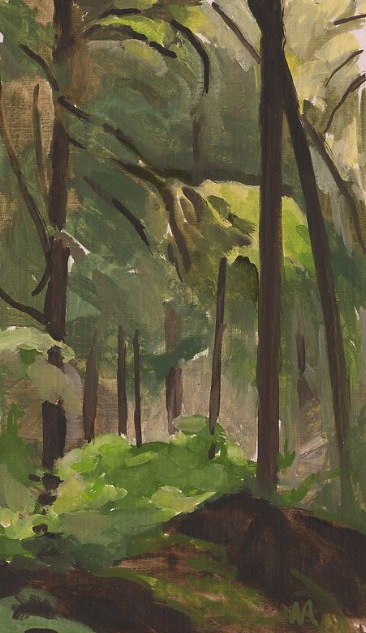 Camping in the rainforest of the Olympic Peninsula was overwhelming in that there is so much beauty everywhere. It took me a day or two to figure out how to deal with it. So this first painting was done in our campsite. Also I had to try out the new portable paintbox/easel I made. It's overbuilt; it would survive a direct asteroid hit. But it works. I've been remiss in my posting, but not in my painting. I just spent a week camping, hiking and painting near Lake Quinault on the Olympic Peninsula in Washington. But I'm getting ahead of myself. 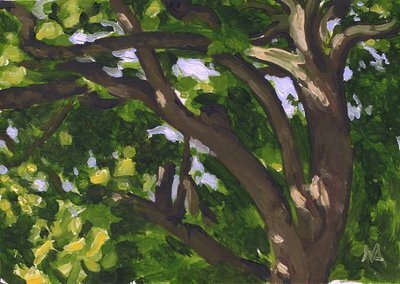 Here's another painting of the big Chestnut tree that borders Jim and Babette's property here in Portland. I really like this tree.